Aside from slipping nasty products like Meatloaf Muffins and Sockeye Salmon Pasta by us once in a while, the meanest trick our friend Trader Joe likes to play on us is discontinuing amazing products like Lemon Gingersnap Ice Cream. TJ's execs clearly aren't reading our blog enough. If they were, they wouldn't have taken away my beloved Organic Tomato Bisque. It was the perfection of tomato soup, in my self-important opinion. And if it ain't broke, Trader Joe, please don't try to fix it. Now, I'm not saying this roasted red pepper stuff is bad. It's certainly not. It's just that it's so similar to the tomato bisque, that it's kinda pointless. If it were a slight improvement, I could understand. But it's not. There are no soft lumps of perfectly-stewed tomatoes. And if anything, the tomato flavor is dulled down just a tad. 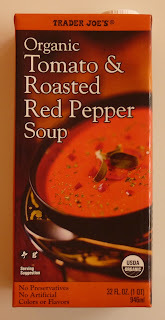 To this product's credit, it does taste slightly of red peppers, but the tomato-pepper combo just doesn't do it for me the way the pure tomato lusciousness did in the bisque. Now I might just be illogically clinging on to something from the past in the same manner I was repulsed initially by the extended versions of the Lord of the Rings because they weren't exactly the same as the perfection that was the theatrical versions. But in the case with LOTR, each viewing made me like the extended versions more. In the case of this soup, each bowl simply makes me miss the bisque more. Please forgive me for this nerd-tacular comparison. In summary, I think this soup falls just slightly shy of its potential. While the taste is similar to that of Trader Joe's Organic Tomato Bisque, whose spirit shall live on in the halls of our Pantheon long after its cans are forgotten by the shelves of your local TJ's store, this tomato red pepper soup's flavor is good but not amazing, and its texture is that of traditional creamy tomato soup. But make no mistake, as whiny as this post may sound to you, this soup is still really darn good. My wife agrees, but she won't dock this product as much as I will. We gave the bisque a perfect score. She'll take away half a star for this soup. I'll have to knock off two full stars. 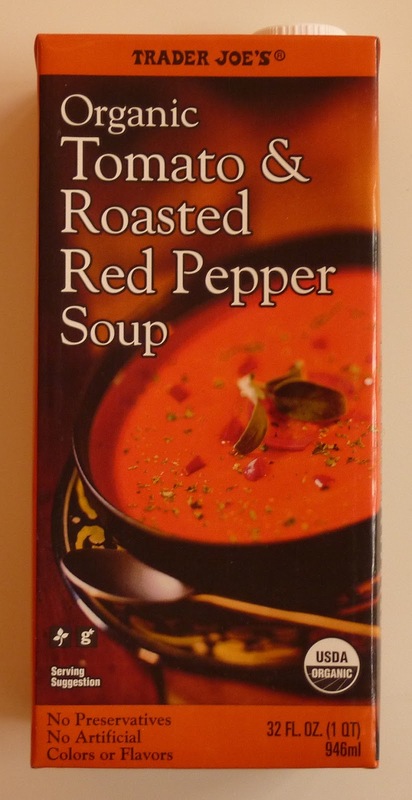 PEOPLE: Do NOT get the low sodium version of this soup (red pepper/tomato)! It is AWFUL, and they even charge you .20 more. Not worth it. Tastes nothing like the buttery creamy regular soup! Got that right. It is DISGUSTING! Cow Milk! Ugh! Why would they put something like this in a soup? This is my favorite tomato soup. I'm now spoiled for any other brand. Never tasted the tomato bisque, though. Did they discontinue lemon gingersnap ice cream?? I'm with Maeve, this is my fave too but never tried the other one. Who told you lemon ginger snap was discontinued? It was at my TJs this afternoon.... I was once told their warehouse is in PA, so if I am able to get it, you should too! You can always ask them to place a special order/customer hold for you. I agree completely about the tomato bisque - heavenly. I won't miss this one. After the bisque, it doesn't cut it. I now pay a ridiculous price for Amy's Organic Tomato Bisque. Oh, how I wish TJ's would get back their bisque. We still have the ginger snap ice cream at ours. We no longer have this soup and we use to LOVE it!! I picked up a thing of the low-sodium version which was just alright and can't find that now either. This soup definitely is not as good as the tomato bisque, but I have come to really like it. I think it's a bit bland, but a little Herbes de Provence or basil and/or sour cream really steps it up. This soup is awesome! I tried it during a 21 day liquid fast last month so of course, to me, it tasted like the back end of a meatball sub where the meat is all gone and there's nothing left but sauce and bread. Mmm yummy. Yeah the hunger may have played a big part in my enjoyment of this soup! However, I also had some sweet potato variety that made me want to gag That baby food mess is STILL sitting in my fridge. I am so surprised with all the positive reviews of this soup. After heating it up, I was overwhelmingly disappointed to find that it just tasted like hot milk with red pepper paste mixed in. I'm not a fan of milk-based soups -- the Trader Joe's site even suggests adding in a dollop of sour cream or creme freche... CREAM ON CREAM? No, never. This soup was not great. It got a 2.5/3 out of ten from me. Maybe I'm not a box-soup kinda gal. Bummer. Yeah, Ryan. It's good as it is, but I'm sure it would be even better with spices and hot sauce. We are big fans of the Tomato & Roasted Red Pepper soup (the versions with low sodium and without red pepper are awful), but I have a strong concern with the new lid on the UHT box it's packaged in. How many times have you seen someone peek to see if a seal is intact? I've seen it many a time... and with the old rectangular flip up lids you Could check, but with the new round screw off lids that break the seal upon opening, they All appear to have been breached if checked, and there is No Way to know, when you get your box home, if the seal was intact before You opened it. The box doesn't "sigh" the way a can does nor can you flex the lid to test seal. You could be buying a box that has sat opened on the shelf for days. Half the point of the seal is to assure the customer of the integrity of their food, and this seal does not do that.